I like the bow on Piper's dress. She looked great with her red lipstick and sleek ponytail. Jessalyn's dress is pretty, but I have no idea who she is. Julia' dress is a bit matronly. Halle could have covered up more, but looks fabulous no matter what she wears. Sidenote: If you notice a dress or two missing, it could be because I'm saving them for last. Julianna Hough was my favorite of all these... mainly because her hair looks beautiful. I noticed that black is the color this year. And a lot of mermaid style dresses too...at least they all got the same memo. 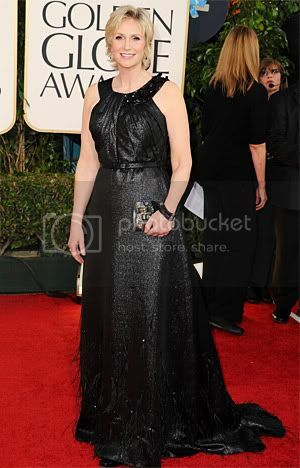 Don't really like Jane's dress, not very flattering for her. OMG.......I LOVE Jessalyn's dress! Its Gorgeous!!! Halle, not a great dress. But she's always gorgeous not matter what! Totally agree about Julia Stiles. I don't know what Halle Berry was thinking though - she's so gorgeous (obviously!) but she looks terrible in whatever that thing is she is wearing - I'm pretty sure I could have made that LOL!! Loving Giuliana, Julianne, Jessalyn & Julia.. they are all stunning!! The bow is weird on Piper's dress. And I'm not usually one to dislike a bow! Jayma's lipstick does not look good on her. And I hated Jennifer Lawrences' dress. Halle looked tacky! I love Halle Berry. She could wear a garbage bag and look good. Not digging Jane Fonda or Jayma Mays' dresses. I like the funkiness of Jennifer Lawrence's dress. I wasn’t really impressed with any of the black dresses I saw. Jane needs to give it up! Nothing like a great black dress. I love most of these .. however I have to say.. I really can't stand G.. she gets on my last nerve... sorry E! Jayma looks WAY different than I've ever seen her before! I just finished season 5 of Dexter. I'm bitter that Jane Lynch beat Julia Stiles. Especially when she had the nerve to wear that thing.